This week is going to be a time of reflections, and clarity- even if it is a seriously dramatic shift taking place- it will be for your highest purpose. We have two powerful eclipses now behind us, so we can finally observe the byproduct of these cosmic events. 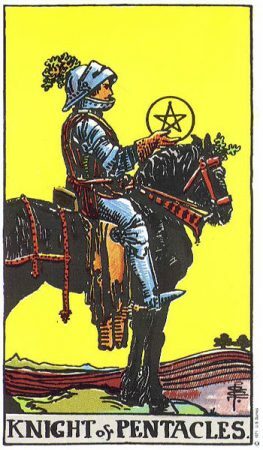 The Knight of Pentacles points to messages, often about money and finance. You are likely to finally receive news that you’ve waited on, and this news is likely to be good. This Knight is a very practical card. The news in question is unlikely to be that you’ve won the lottery.The Knight tells us to pay attention to the mundane and normal parts of our lives. A wise man once said, “Take care of the little things, and the big things will all fall into place.” The Knight of Pentacles asks you to look at how you are handling your affairs, and is a grounding influence. Your creativity and association with business associates may come under fire this week so approach this situation with a delicate hand. With your ruler, Mars in the mix you may be stepping into a hot-bed of opposing ideas and opinions regarding a joint effort. Take the high road of possible and avoid the fray. The Two of Swords is often a card about partnership and balance. It usually refers to a “partnership” with just one other person as opposed to with groups of people. This card shows a need for give and take. None of us are always right 100% of the time, and everyone to some degree has something to offer. Consider to what degree your life, and your partnerships, are in balance. 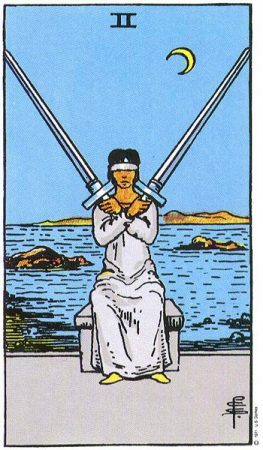 The Two of Swords tells us that your partnerships are likely to be going at least somewhat well, whether these be friendships, romantic, or business. However, you should consider the depths of your commitment to equality in these and whether you are being treated as an equal by your partners. If you are not, it may be time to bring things back into balance. This will almost certainly must open communication on your part. Nothing changes without effort. The Queen of Cups is among the most loving archetypes in the tarot deck. She indicates compassion, love, and concern for ourselves and our fellow man. Often when the “court cards” come up in a reading, they indicate an actual person, in this case a woman, in our lives. The majority of the time when the queen of Cups appears, and is “standing in” for a person, she is representing a female with hair on the lighter end of the spectrum.The Queen of Cups indicates female energy that is solidly “in your corner,” that women in your life are very much supportive of you and/or that a woman will come to your aid. 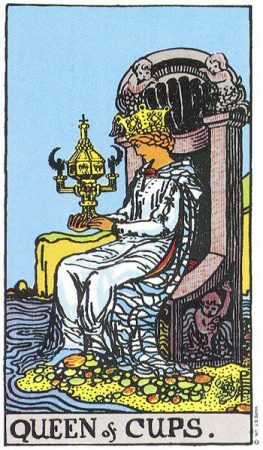 The queen of Cups also reminds us to treat ourselves with love and compassion. No matter who and where you are, there are things in you that are worthy of love and respect. Strength indicates the importance of mind over matter, and reminds you to focus on what you do want and not what you don’t want in your life. Its main point is that you have the ability to harness your thoughts and to use them for your – and everyone else’s – highest good. Not only do you have the ability; you have the responsibility. So conquer your fears, control your impulses, and never lose patience with yourself or what you are doing.It’s important now for you to make time to meditate and contemplate and spend some time alone even if you are in a committed relationship and have nineteen children! Do not allow yourself to spend time in preoccupation and fear. Outward things will be going all right but what is of the most paramount importance is keeping your head on straight. 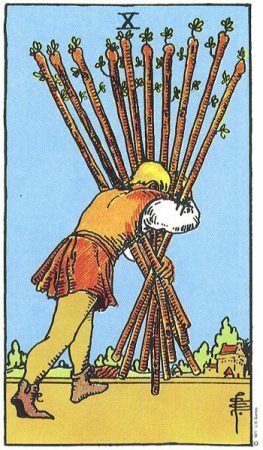 The Ten of Wands can make you may feel as though you are carrying a very heavy burden. You may want to look hard at this and see if there are any ways that you might lighten your load either literally or figuratively. If you look carefully you may find that part of the burden you are carrying emotionally actually belongs to someone else. It is important for you to pace yourself now. Don’t try to do too much.Sometimes the Ten of Wands indicates that you have been too successful and would be well-served by scaling back. You are probably tired, you’ve worked very hard, personally and professionally, and could use a break. Give yourself one. Try and rein in your ego this week. Granted the Sun is in Leo and that can be a wonderful experience, especially for you. With the spotlight on, you may feel emboldened to dominate. However, watch for sudden changes in your workplace that could shift the dialog dramatically. 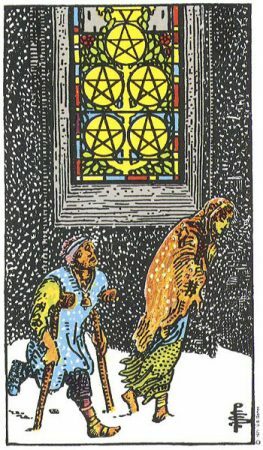 The Five of Pentacles can point to a time when life is feeling less than secure. The important thing to remember is that there is always help available when we need it, from forces both seen and unseen. You may feel alone, but you have the capacity to change that. Reach out.You may be feeling of being left out in the cold, as though everyone else in the world has everything and you are the only one that is suffering. Realize that this is not the case. Do the best you can, with what you have, but remember that the wise thing to do, if one needs help, is to go out and ask for it. The help you need will come. The King of Pentacles speaks of authority, tradition, and success in money matters. It’s a sign that now is not a time to be a maverick, now is a time to follow the established way of doing things. 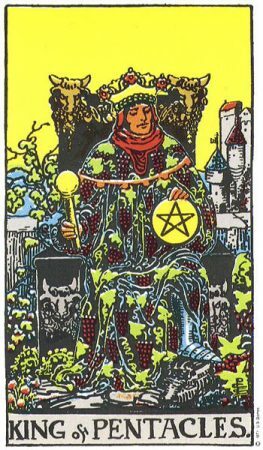 When he stands in for a literal man in your life, it generally refers to a very masculine fellow with hair and eyes on the darker end of the spectrum.The King of Pentacles urges us to be good stewards: of our lives, of our energies, and the concrete resources that are available to us. If he’s referring to a man in your life, know that this is a man who you can believe in and trust absolutely. Expect to see some action occurring with children this week. Children and your creative output may be under duress as Mars and the Sun opposes each other. Elderly relatives may deliver some unanticipated news that throws your routine into disarray. If you uphold the structure of the family and home success is more likely. 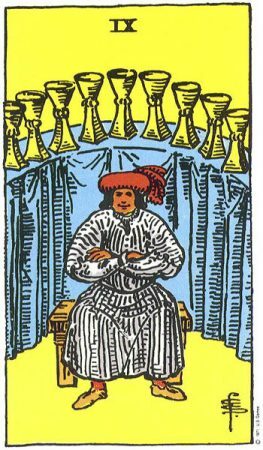 The Nine of Cups is one of the most uplifting and pleasant cards to receive in a reading. 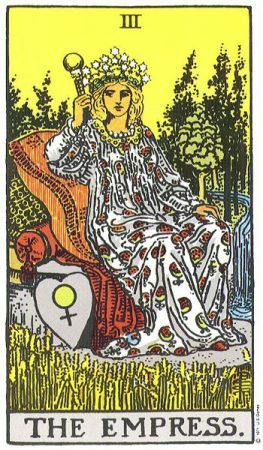 Known often as the “wish card” it can mean that what you are hoping for or dreaming about most is very likely to be yours – in a brief period of time, generally, too.The appearance of this card is usually a portent of happiness, and good things about to come. It also usually means that what you want is likely to come into being in your life. 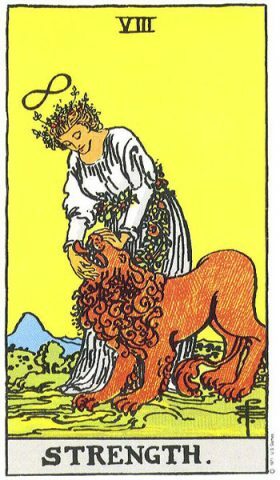 If asking a yes/no type of question, this card is the most powerful indicator of “yes”, but like everything else in the tarot, that is not carved in stone. You may be flying high with regard to your career but keep an eye on domestic tangles which could bump up against your current gains. Significant partners offer unusual advice that might be counter to what you envision. This is a time for cooler heads to prevail. 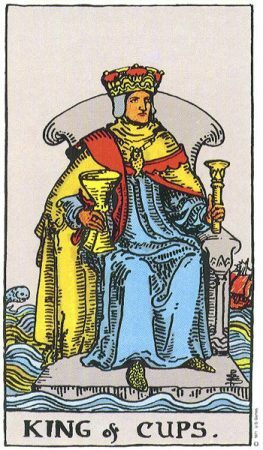 The King of Cups speaks of balanced male and feminine energy; he holds all the positive qualities of both masculine and feminine. Often he indicates a literal man in your life. Usually a very kind and loving man, who will generally have light-colored hair. Know that you are supported by the universe, in ways seen and unseen, when he appears.He represents kindness and compassion. There is an element of pure and true love in your life no matter what your situation when he appears. Nurture yourself, and allow others to nurture you. The Empress is an archetype of feminine power; she is watery, hard to fathom, mysterious, and caring. She augurs a need for us to be in touch with our feminine side, to listen to our intuition, and to give priority to our emotions and passions. And she can signify coming abundance. The Chariot indicates a lot of energy but not free-for-all energy. It’s directed, controlled, and has a goal in mind. 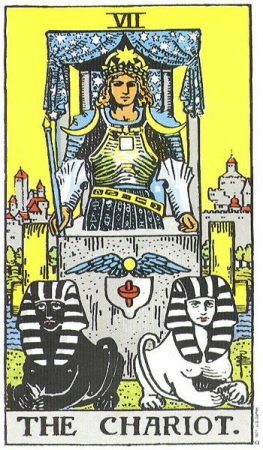 When this card appears you are likely to be fairly clear on what your hopes and dreams involve and what you are willing to do to make them come true.The Chariot points to determination and ambition. It’s about getting things done, and testing and proving that you’ve got what it takes. This is a sign that you should move forward with whatever you have in mind (and in your heart) and give it your best shot. Remember, though, that you’ll need to use both your intellect and your heart, to be truly successful. Watch your temper this week as Mars sits in Aquarius and might impel you to respond inappropriately. Relationship topics may be the source of a surprise that relates to your domestic situation or family. Try to bend the conversation in accordance with diplomacy for best outcome. 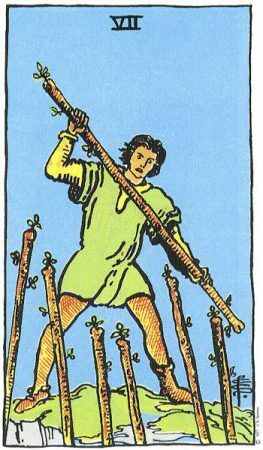 The Seven of Wands means that in any sort of competitive situation, you are likely to come out on top. So things should be going very well, you should be feeling good, and projects should be moving right along. You may still have regular moments of self-doubt, unfortunately, but now is time to feel the fear, and do it anyway.Don’t hesitate to make where you stand clear to people. Your thinking is clear, and you are likely to help someone out by spelling things out for them. This card can show that a change is coming, a positive change in your personal or business life. This card also points toward being independent and thinking for yourself. Sudden changes could arise that throw your schedule out the window and leave you in disarray. Slow methodical thinking may be the antidote to rising tempers.